Three years ago today, the world lost one of the good guys. 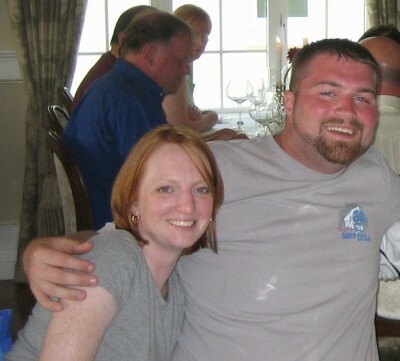 My cousin Erin’s boyfriend Dan was killed in a tragic car accident. 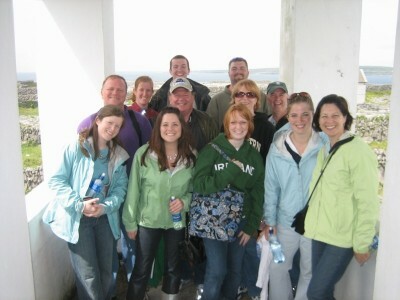 We had just returned home from one of the best vacations of my life – a family reunion in Ireland – and his death shocked us all to our core. Dan was more than Erin’s boyfriend. He fit in our family as if he’d been there all along, and in Ireland, he asked my uncle Kevin for permission to marry Erin, which we were all ecstatic about! He was just one of those people that lit up a room and I think of him all the time: anytime I drink a Guinness, see an F-150 or a guy wearing a bright orange shirt. I think of him when I see a guy talking excitedly about the Yankees or golf or when I see a big teddy bear of a guy laughing out loud. Dan was always smiling and always laughing and left such a mark on me that it’s impossible not to think about him. There are different people in Heaven that I think take care of Brienna in different ways. When I think of who she runs to if she’s needs a big bear hug, I think of Dan. When I think of who makes her laugh, I know it’s Dan. I know that they are up there together and it comforts me, while making me sad at the same time. They should be here. My cousin Erin is a strong lady … she has been such a source of strength and inspiration for me and she continues to amaze me every day. I remember bewilderedly asking her how she survived every day. Her grief, pain and suffering were just incomprehensible to me. She told me that she realized she had to make a choice. She could choose to live, or she could choose to be miserable. So she chose to live. When Brienna died, those words stuck with me, and I think about them every day as I get out of bed. It truly is a choice. It would be so easy to be bitter and miserable (and there are those days) but the choice to live a life that makes them proud is more alluring. That was sweet, what a nice tribute to Dan. Conroy girls are strong people and you and Erin are both inspirations. I think of him often too, especially when I eat brownies 😉 Miss you Dan, and love you Erin and Laus! You caught the essence of Dan as well as Erin’s strength & love her for him. Our lives are better for having known Dan & Brienna. You & Erin are amazing young women of great courage & love. What a beautiful tribute to a very special man. Losing someone so special is not easy to understand. The strength and faith that you and Erin have shown every day since your lives have taken an unexpected turn is truly an inspiration. Cannot believe that Dan has been gone three years. it was such a deep loss for Erin, his close family and all the Conroys. I wish I could have known Dan more….he was loved by so many people that we have to wonder why? At least we know he was there to greet Brienna, your little angel, in his open arms. Love you all and think of you all the time. Next Next post: Happy Birthday Bailey!